You don't need to have local knowledge to have a wonderful time in Kansas City, but you should know a few basic details before you take off. This city is approximately 55 miles (89 kilometers) east of Topeka, the state capital of Kansas, and about 20 miles (32 kilometers) northeast of Olathe. Visitors to this area of Northeastern Kansas will be sharing space with about 150,000 people. Get unbelievable savings on travel packages via Travelocity. Simply pick from more than 400 airline partner companies and 665,000 places to stay, and you'll be off to Kansas City in a jiffy! Our Customer 1st Guarantee gives you the added comfort of 24/7 personal assistance on everything from airfares and accommodations to car rentals and experiences. If you chance upon an even lower price on a different website, we will refund the difference^. With no hidden fees from us, you don't have to stress about changing your vacation plans. And so long as you get in quick, many accommodations won't charge a fee either^. A superb vacation is just a few clicks away with Travelocity. Choose from 49 accommodations in Kansas City then start counting down the days until you jet off! Who doesn't enjoy life's luxuries? If you want to indulge for a couple of nights, book a room at The Raphael Hotel, Autograph Collection (325 Ward Pkwy) or The Fontaine (901 W. 48th Place). The Hampton Inn Kansas City / Downtown Financial District (801 Walnut Street) and the Sheraton Kansas City Hotel at Crown Center (2345 McGee Street) are some thrifty options if you'd prefer to spend your money on activities and experiences. Where do you fly into for Kansas City? Nothing's better than finally touching down in a brand new place. If you're traveling to Kansas City, there's every chance you'll be disembarking at Kansas City International Airport (MCI). It's around 14 miles (23 kilometers) to the north of the central area. Pick up your suitcase and get ready to kick-start your vacation! Can I rent a car in Kansas City? Wander through Kansas City and experience the distinct culture. If you intend to explore further out, getting a rental car via Travelocity is a great choice. There's no reason to waste time trying to figure out the most economical way to get into town. Pick up a car from the Kansas City International Airport area and save yourself the trouble. Payless and Fox Rental Cars are both in the vicinity. Unfortunately, there are no rental outlets in the city. So if you're thinking of getting a vehicle in Kansas City, you'll need to travel to one of the surrounding neighborhoods. You'll find Enterprise in North Kansas City at 1412 Burlington St. Experience the true essence of this bustling metropolis by enjoying places like Crown Center and the Liberty Memorial. If you've got a little more time up your sleeve, the Kemper Museum of Contemporary Art and the Hallmark Visitors Center are well worth seeing too. Sure, having a dance to music over the radio is great, but nothing compares to the atmosphere of going to an electrifying live performance! So why not buy front-row seats to an event at Granada Theater? Need some more options? Looking to take in a conference or event while you're visiting? Check the schedule at Kansas City Convention Center and see if anything captures your interest. And there's more. If you wouldn't mind some spiritual enlightenment on your getaway, stop by St John the Baptist Catholic Church. Who knows, you might even find the answers to a couple of life's greatest questions! If you have explored the best of Kansas City and have an extra day or two up your sleeve, try not to panic. You'll find great attractions just a stone's throw from here. Basehor is around 17 miles (27 kilometers) away. People often come here to access Legends Outlets Kansas City. As one of the largest cities in Kansas, Olathe also boasts easy access to Kansas City via Interstate 35, making it a great vacation destination for those seeking entertainment variety and heartland comfort. An Olathe vacation provides access to historic sites, music events, and outdoor activities. Plan a family-friendly holiday or an adult adventure with Olathe vacation packages. This smoke-free hotel is 1 mile from Corporate Woods Office Park, 2 miles from Oak Park Mall, and 5 miles from Town Center Plaza. Downtown Kansas City is within 15 miles. 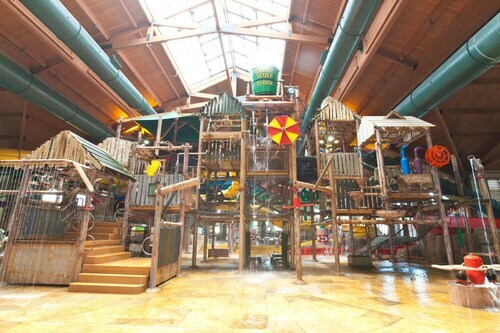 This family-friendly Kansas City resort is within 1 mi (2 km) of Village West, Legends Outlets Kansas City, and Hollywood Casino at Kansas Speedway. Schlitterbahn and Kansas Speedway are also within 2 mi (3 km). Situated in Lenexa, this hotel is 1.2 mi (2 km) from 3 and 2 Baseball Park and within 3 mi (5 km) of Legler Barn Museum Complex and Tomahawk Hills Golf Course. Falcon Valley Golf Course and Johnson County Museum are also within 6 mi (10 km). Situated in Overland Park, this condo building is within 3 mi (5 km) of Overland Park Convention Center, Towne Center Plaza, and Corporate Woods. Overland Park 9/11 Memorial and Museum at Prairiefire are also within 6 mi (10 km). Situated in Overland Park, this hotel is within 3 mi (5 km) of Overland Park Convention Center, Towne Center Plaza, and Corporate Woods. Overland Park 9/11 Memorial is 2.8 mi (4.5 km) away. Situated in the business district, this hotel is 0.7 mi (1.2 km) from Overland Park Convention Center and 1.4 mi (2.2 km) from Towne Center Plaza. Corporate Woods and Museum at Prairiefire are also within 6 mi (10 km). Situated in the suburbs, this hotel is within 1 mi (2 km) of Johnson County Community College, Nerman Museum of Contemporary Art, and Johnson County Community College Carlsen Center. Oak Park Mall and Corporate Woods are also within 3 mi (5 km). 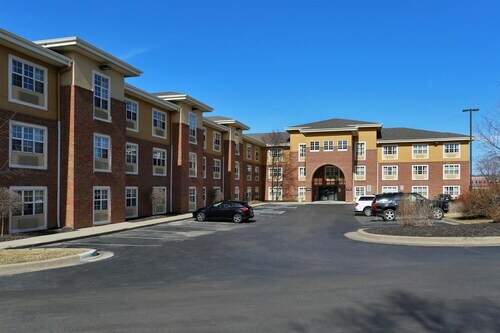 Located in the heart of Overland Park, this hotel is within 3 mi (5 km) of Overland Park Convention Center, Corporate Woods, and Towne Center Plaza. Overland Park 9/11 Memorial and Johnson County Community College are also within 6 mi (10 km).